Exciting news - Thames is to get a statue of Sir Keith Park. While the nearby aerodrome is named in Sir Keith's honour, to have such a prominent reminder of this famous soldier is amazing. 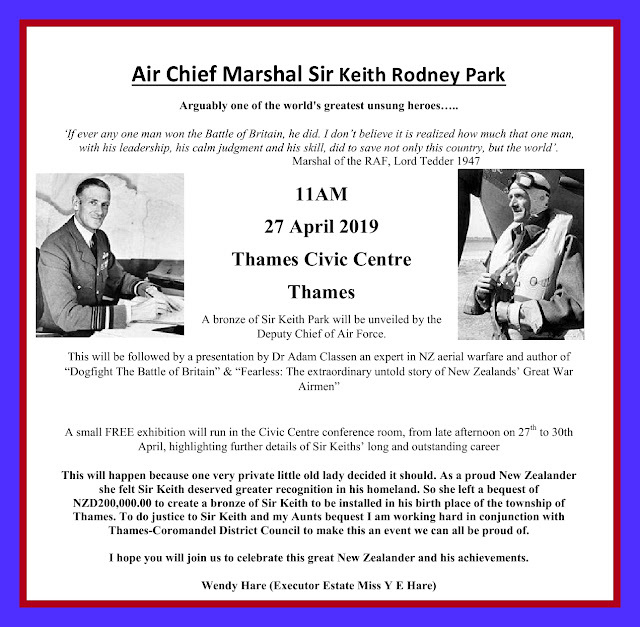 The unveiling of the statue is to take place 11am 27 April 2019 (full details below). Background: The following article appeared in the book "From Gold Mine to Firing Line." There are many men and women from the wider Thames area who deserve a special mention for the services they rendered during World War One. The names of some will be found in the awards section, indicating they received official recognition. Many more will have gone unrecorded and their deeds never officially acknowledged. There is however one soldier who first made a mark in World War One and subsequently went onto to serve at the highest level in World War Two. His name was Keith Rodney Park, Serial Number 2/1254. On 15 June 1892, at Thames, Keith Rodney Park was born. He was the son of Frances and James Park. James Park was from Scotland and had attended the Royal School of Mines in London. In New Zealand he married Frances Olive Rogers in 1880, they had seven daughters and three sons. In 1889, James Park was appointed director of the Thames School of Mines and was responsible for many innovations and developments at the school. The Park family lived out at Totara just south of Thames, locals recalled in 1946 that the house was a two-storied building on the Thames side of the cemetery – looking over the lower Kauaeranga Valley. The house was known as the Park house and later occupied by the Northcroft family. More details on the young Keith Park’s time at Thames can be found in the school records of his siblings. They attended various schools in the town including: Kauaeranga Boys and Girls, Parawai, Thames High and Tararu Schools. From 1889 to 1900 the family’s address varied from: Mt Pleasant, Moanataiari Battery, Queen St, Tararu and Totara. This was not uncommon in the lives of many Thamesites who travelled around the township and the schools at somewhat regular intervals. The last record for the Park family at the Thames, is in the Thames Electoral roll of 1900. Frances and James Park’s residence was given as Tararu Foreshore, Thames. Keith Park received his later education at King’s College in Auckland and the Otago Boys’ High school in Dunedin. Like many young boys he served in the cadets and then was a territorial soldier in the Army. In 1911 he worked at sea as a purser. At the start of the war he enlisted and commenced duty 14 December 1914. Park’s enlistment address was 77 Saint David Street in Dunedin and his father was named as next-of-kin. Serial Number 2/1254, he was a member of the Field Artillery, promoted to Corporal on 1 February 1915 and he embarked from New Zealand on 14 February 1915 from Wellington. Park was aboard Transport ship No 17, the HMNZT Maunganui, which arrived at Suez 26 March 1915. Little information is contained in the New Zealand war file, the next entry states that 2nd Lieutenant Park was transferred to the Royal Field Artillery on 3 September 1915. He was at this stage discharged from the New Zealand Army – a total service of 264 days. What happened next is featured in a multitude of sources and summarised on the Auckland War Memorial Cenotaph database. [ii] During WWI he served with the British Army, Royal Artillery 1915-January 1916; Royal Flying Corps 1916; 48 Squadron July 1917,1918. “At the outbreak of the First World War he became a gunner in the New Zealand Artillery. Park's commission was granted in Gallipoli in August 1915 for services in the field and was transferred to the 29th Division. He stayed in Gallipoli until the evacuation and, as Lieutenant, went to the Western Front. He was wounded at the Somme and relegated to home service as an Artillery Officer Instructor at Woolwich. What happened next is beyond the scope of this book, but needless to say, the ‘boy from Thames’ went on to be remembered forever for the part he played in World War Two and key events such as the Battle of Britain. Sir Keith Park died in Auckland on 6 February 1975. He is remembered at the Thames airfield which in 2010 was renamed the ‘Sir Keith Park Memorial Thames Airfield’. This was at the same time as the unveiling of Sir Keith Park’s statue in London to commemorate the 70th Anniversary of the Battle of Britain. A Thames boy who left his mark on history. In 1896 James Park had been employed by the Anglo-Continental Goldmining Syndicate. [i] http://www.teara.govt.nz/en/biographies/3p8/park-james & Thames Star, 4 March 1901, pg 2. [iii] Otago Daily Times, Issue 17988, 15 July 1920, page 7.